AMD’s Radeon RX 590 is the best 1080p graphics card you can buy, and at $280, it won’t break the bank. But the Sapphire Radeon RX 590 Nitro+ we’re reviewing today proves it’s even better than we originally thought. The card draws an immense amount of power, and the XFX Radeon RX 590 Fatboy that AMD sent U.S. reviewers ran hot despite coming equipped with a massive triple-slot cooler. Pushing AMD’s Polaris architecture so far—this is the same GPU’s third incarnation, after the Radeon RX 480 and 580—requires heavy metal, we concluded at the time. While that’s still true, Sapphire’s graphics card shows that the Radeon RX 590 doesn’t have to be gargantuan. 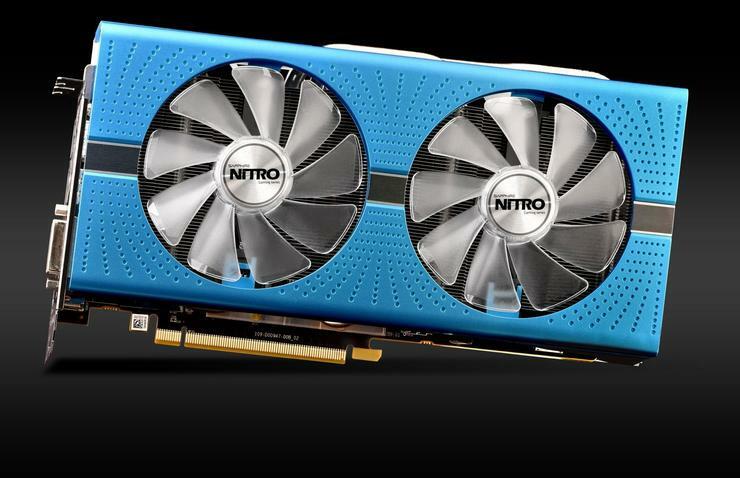 The bright blue Sapphire Radeon RX 590 Nitro+ ($280 on Newegg) comes loaded with features. Even more impressively, it manages to hit higher frame rates and lower temperatures than the XFX Fatboy despite fitting in a standard two-slot design. This is the best Radeon RX 590 we’ve tested. 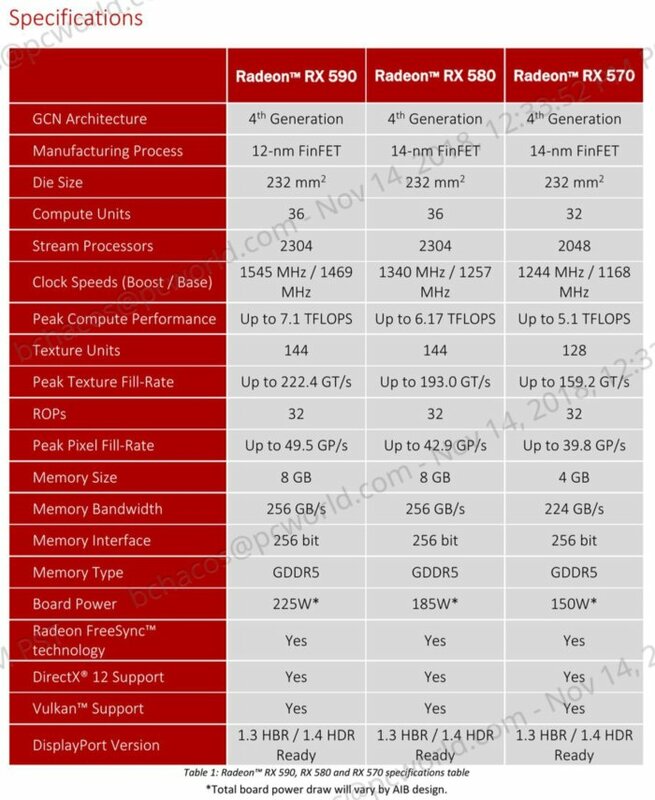 The Radeon RX 590 is almost identical to the Radeon RX 580 under the hood, utilizing the same underlying configuration, but on an improved 12nm manufacturing process. That process shrink lets AMD’s new GPU hit much faster speeds than the Radeon RX 580 and RX 570, which will continue to be sold as well. The Sapphire Radeon RX 590 Nitro+ pushes performance even further. It ships with a 400Mbps effective memory overclock, and the GPU clock speeds hit 1,560MHz, a slight boost over the 1,545MHz reference spec. That’s also slightly slower than the 1,580MHz XFX Fatboy on paper. But as you’ll see in our benchmarks later, Sapphire’s card manages to meet or even slightly exceed the Fatboy’s performance in games, thanks to its memory overclock and potent custom cooling system. 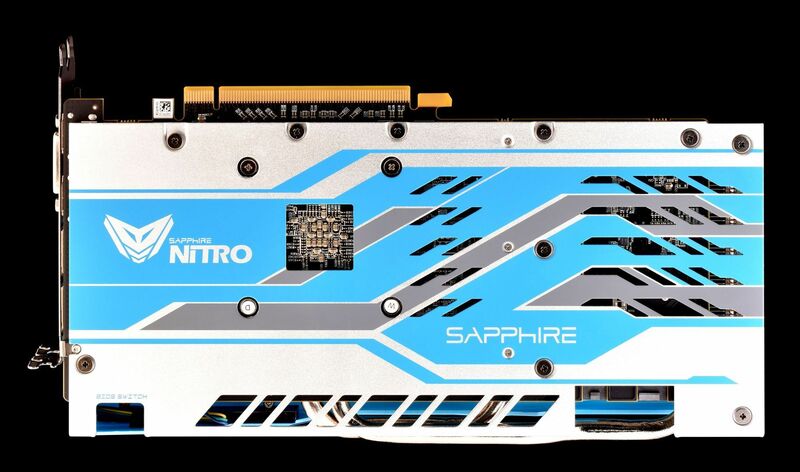 Sapphire relies on its flagship Nitro+ custom cooler to tame the RX 590. Starting at the core, Sapphire switched to a new thermal paste that it claims improves thermal conductivity between the GPU and heatstink by 30 percent. The 54-fin heatsink is augmented by a pair of 6mm and a pair of 8mm heatpipes. The fins are aligned with the length of the card to help dump hot air out of the back of your system. A pair of large, dual ball-bearing fans infused with blue LEDs are centered in the card’s attractive blue shroud. 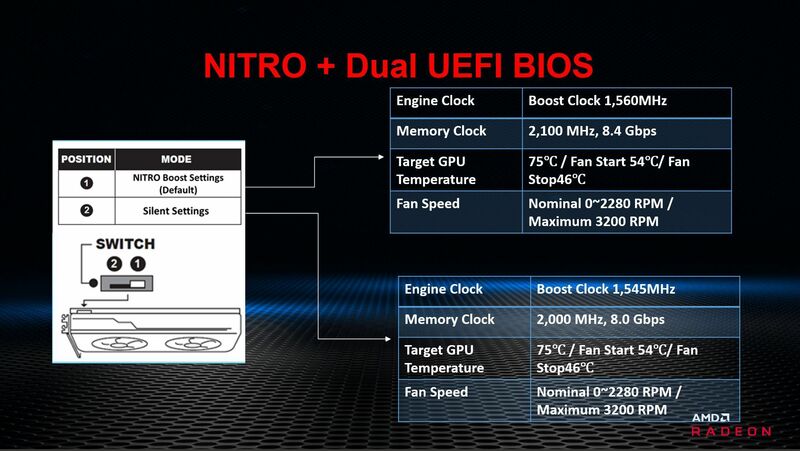 Those fans remain idle when the Nitro+ is under light loads—even in the menu of games—and use Sapphire’s Quick Connect technology for easy replacement if needed. You can use Sapphire’s Trixx software to check on the status of your fans. The card comes with dual BIOSes, which you may toggle via a switch on the Nitro+’s edge. The default Nitro Boost profile hits the advertised 1,560MHz clock speeds by ramping up the fans. Shifting the BIOS switch to the left enables a Silent setting—called “optimized for compute” on the packaging, oddly enough—that greatly reduces fan noise but drops down to the reference speeds for the memory and GPU clock. We only conducted full testing on the default high-performance profile, but even that didn’t get overly loud. The Silent setting lives up to its name. Sapphire designed the Radeon RX 590 Nitro+ with overclocking in mind. The PCB has two extra layers for more power and lower temperatures, and the card’s equipped with Sapphire’s signature black diamond choke and a 200,000-hour polymer capacitor. 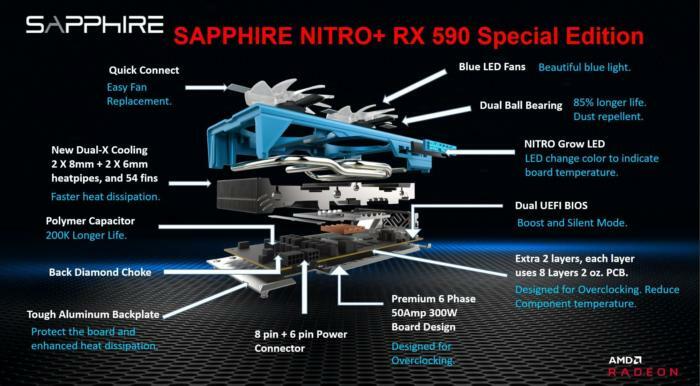 The 6-phase board was designed to handle up to 300 watts via its 6-pin and 8-pin connectors, and if something somehow goes wrong, Sapphire equipped the Nitro+ with an extra PCI-e fuse for protection. The card’s topped off with a sturdy gray-and-blue metal backplate, completing the Sapphire Radeon RX 590 Nitro+’s sleek futuristic look. Aesthetics are subjective, but to my eye, this graphics card is gorgeous, especially if your PC packs blue, silver, or white components. A pair of DisplayPorts, two HDMI connections, and a DVI-D port give you plenty of audio/visual options. GeForce-beating performance isn’t the only reason to consider buying this card. AMD is keen to tout the wide array of affordable FreeSync monitors available for buttery-smooth gaming, and rightfully so. Nvidia’s rival G-Sync monitors are targeted only toward premium crowds rather than the masses. AMD will also toss in three free games—The Division 2, Devil May Cry 5, and Resident Evil 2—when you buy a Radeon RX 590 at participating retailers, making this card an outstanding value if you’d planned on picking up any of those titles. They won’t be available to play until early next year, though. Enough chit-chat! Let’s take this to the bench.